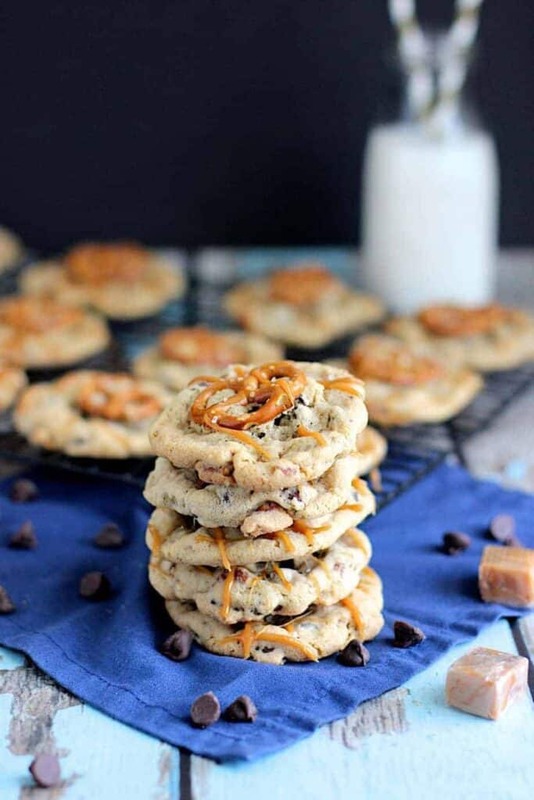 These Salted Caramel Pretzel Chocolate Chip Cookies have it all! 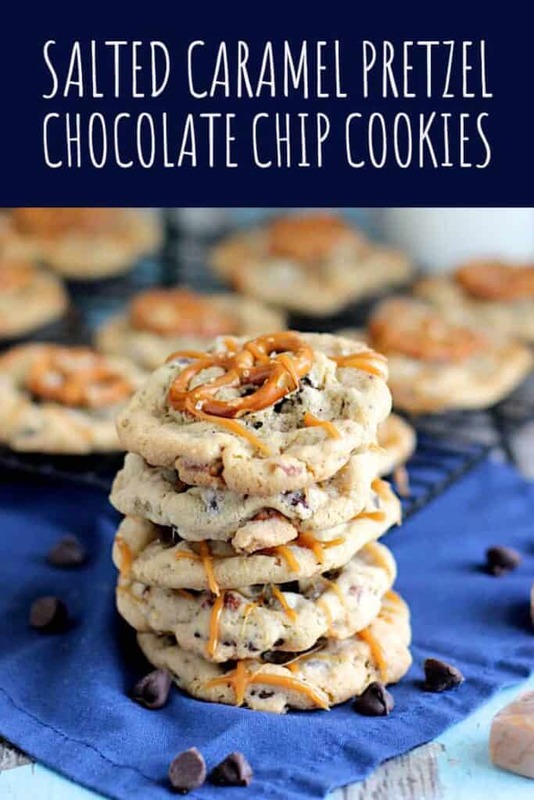 They’re salty and sweet, chewy from the caramel, crunchy from the pretzels, and are studded with chocolate chips. You guys! I finally got back in the kitchen and baked something! It’s been a while. 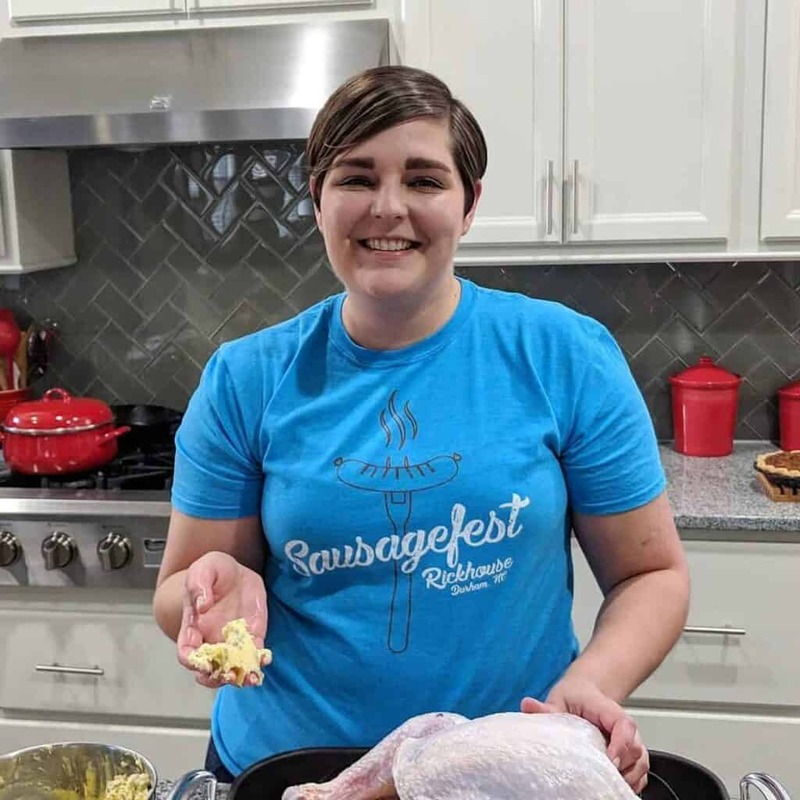 As I noted on A Nerd Cooks’ Facebook Page last week, the reason for my recent lack of online presence is that I’m on a grant deadline. I’m aiming to submit it this Friday, so hopefully things will return to normal after that. Despite me currently having grant brain, we had friends come to visit this past weekend, so I couldn’t pass up the opportunity to bake a treat for them. The original recipe for these cookies called for the caramels to be hidden inside of the cookies. 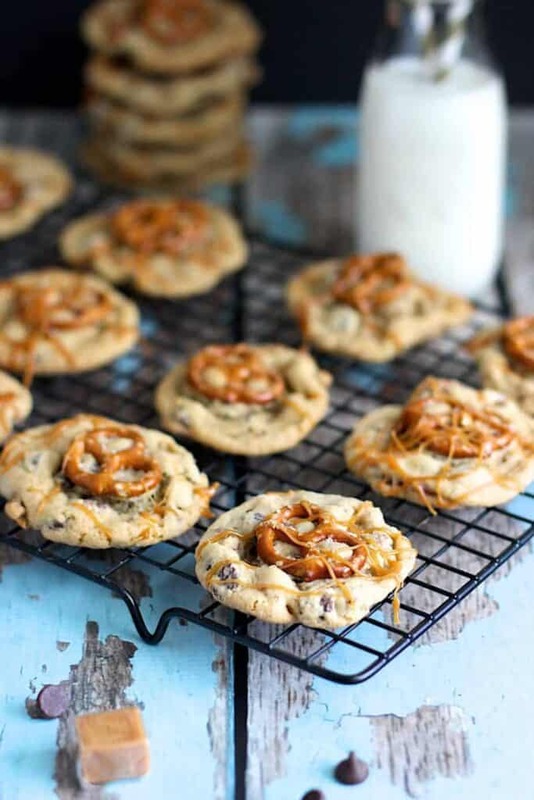 It involved rolling two smaller dough balls and sandwiching the caramel in there. Now, I’m not all about that life. If a cookie can’t be scooped out with a cookie scooper and plopped onto a baking sheet, it’s probably not happening for me. Enter: caramel drizzle. I don’t think anyone will be complaining about the adaptation. This recipe is slightly adapted from Two Peas and Their Pod. Preheat the oven to 350 degrees F. Line 2 baking sheets with parchment paper and set aside. In a medium-sized bowl, whisk together the flour, baking powder, baking soda, and salt. Set aside. In the bowl of a stand mixer, cream together the butter and sugars until they are light and fluffy. Add the eggs one at a time, making sure that they incorporate completely between additions. Add the vanilla extract. In a couple of batches, add the dry ingredients to the wet until things are just combined. Scrape down the sides of the bowl as necessary. 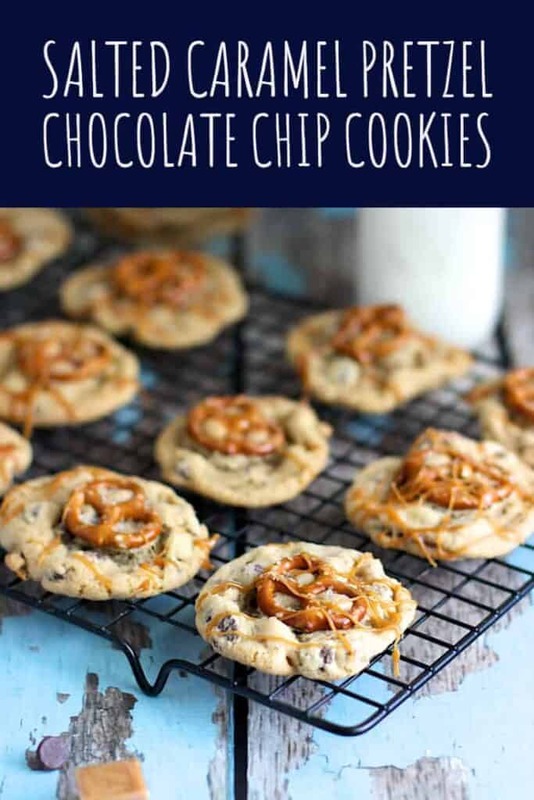 Stir in the chocolate chips and chopped pretzels. Using a cookie scoop, drop cookie dough in ~2 tbs-sized balls onto the prepared cookie sheets, about 2 inches apart. 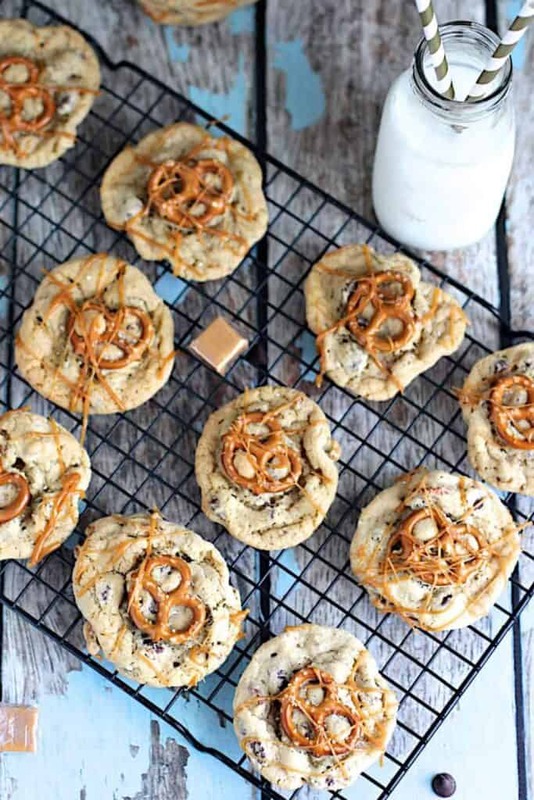 Gently press a small pretzel twist onto the top of each cookie and sprinkle with a bit of sea salt. Bake 10-12 minutes, or until the edges are lightly golden brown. 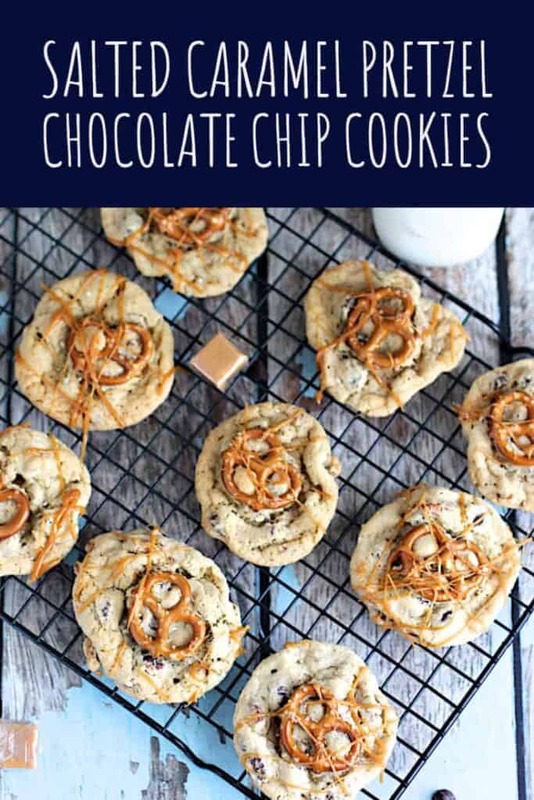 Allow the cookies to cool on the baking sheets for 5 minutes before removing them to a wire rack to finish cooling completely. Melt the caramels in a microwave safe bowl. 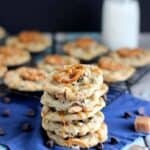 Drizzle the melted caramel over the tops of the cookies. Allow it to harden again before eating. 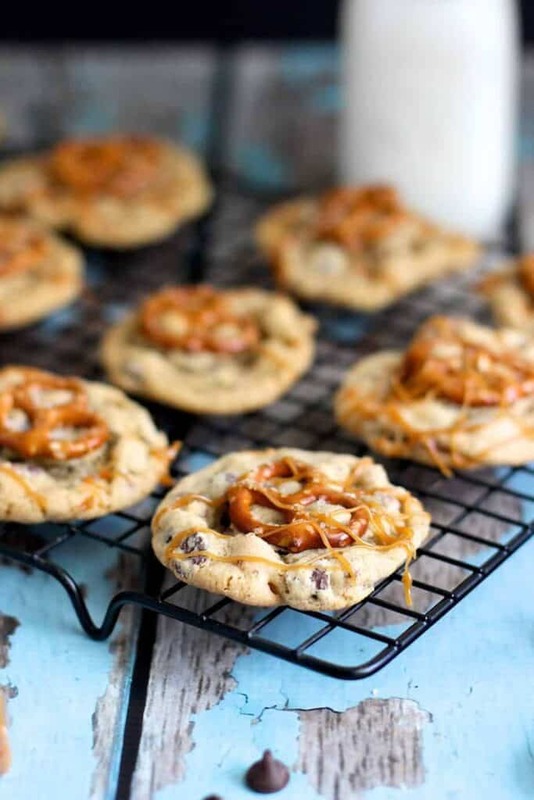 Need more salted caramel goodness? These Salted Caramel Apple Pie bars are legit. Such pretty cookies! love the salty sweet combination. This will cure a few of my cravings all at once! You gotta love a cookie that can do that!